A SUPERSONIC car, which is going to attempt to break the current land speed record, will feature the names of a lucky group pupils from St Louis School in Frome on its tail fin. 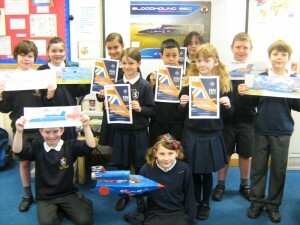 The car, Bloodhound SCC, will reach speeds of 1,000mph – and a lucky group of St Louis pupils will have their names featured on the tail fin of the car. Year 5 pupils from St Louis Catholic Primary School recently enjoyed an exciting trip to the Fleet Air Arm Museum to see the visiting Bloodhound SSC car, made all the more exciting by a prize. Guy Philips, year five teacher explained, “Bloodhound, driven by Andy Green, is going to attempt to break the current land speed record of 763mph. The 7.7 tonne car (propelled by a jet engine and rocket) hopes to break the sound barrier and travel faster than a bullet, going 1,000mph. “The project, through its educational programmes, is hoping to engage and excite children in the maths, engineering and science involved in designing such a super sonic car.